(Admin) How can I add existing or offline documents to an employee's profile? Do you have some offline documents such as resumes, pictures, of ID cards, etc...taking up space in your file cabinets? 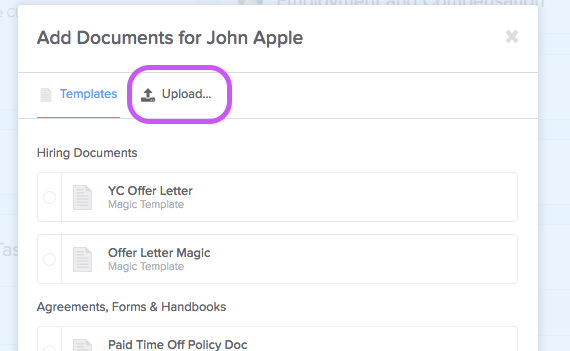 Upload them to an employees records in GoCo! First, navigate to the profile of the employee who has a document needing to be uploaded by clicking Team and selecting the desired employee. Next, click the Documents card on the employee's profile. At the bottom of the list of all documents currently on file for that employee, click on +Add Documents for Employee. From here, click Upload, and then drag & drop the files you would like included. Click the final upload confirmation in the lower-right hand corner of the pop-up, and you're all set!